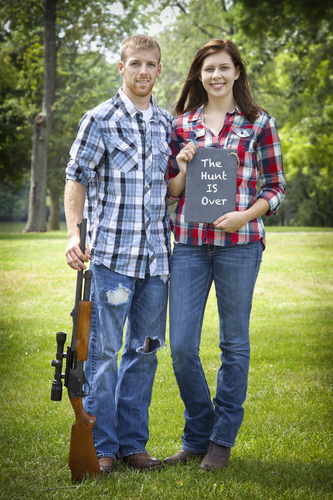 Spending quality time while hunting with your significant other is a great way to bond. The weather is turning and the leaves are changing color. For hunters, this means that the time has come to once again pull out the camouflage and prepare their equipment for the season ahead. If you’re the significant other of a hunter, this is typically a time to prepare for seldom seeing them while they are out in the field in the coming months. Why not make this year different and not have to bid farewell to your hunting lover as they disappear out the door? Hunting is a valuable skill that can allow the both of you to spend more time together and allows for an experience to further bond. Here are some reasons why fall is a great time to be outside and learn how to hunt. The fall season is a hunter’s dream. There are a number of different animal tags to choose from and can be useful when approaching hunting for the first time. If your first-time-hunting girlfriend is hesitant about shooting bigger game, such as deer and elk, you could take her small game hunting and use sage grouse and rabbits as an introduction to the sport. Fall is also turkey season. You and your new hunting mate could make it a goal to get your Thanksgiving turkey together and create a long-lasting memory. Some of the best parts of fall are the cooler temperatures and the ability to get cozy in heavier clothing. It makes wearing hiking boots more comfortable now that the summer temperatures have gone down. You will enjoy getting cozy in your blind with a nice hot thermos of coffee, waiting for your first sightings of the day. Check out the number of sales offered by outdoor retailers on last season’s clothing to outfit your lady (and yourself) with the appropriate wear. You don’t want to discourage your first time hunting partner from joining you on future hunting trips because they were too cold or uncomfortable. Luckily, there are many new women’s hunting clothing options that are continuously being introduced the market. Gaining access to your favorite hunting spot in the fall typically involves a nice hike, while in the summer, the area may be overgrown and make your trek more cumbersome. In autumn, everything begins to die off, allowing for a bit more ease of access. It also offers clearer views, which will likely benefit a beginner hunter. It may also be a nice gesture to venture out to your hunting spot to remove some of the brush and create a clear path to where you’ll be hunting before taking your partner there; they will appreciate you putting in the work for them. The best part about hunting in the fall is gaining time to spend with one another. Most hunters have probably experienced the tension that comes with being absent so often in the fall. By convincing your significant other to come and learn in the beautiful colors of autumn, you can help to avoid any potential arguments that may have arisen in the past. The fall breeze and leaves can create a nice romantic setting for you and your partner to enjoy a new activity together. Go ahead and bundle her up to get her outside with you to enjoy the joys of hunting together this fall! Check out more fall hunting blogs.